Ready for holiday baking? You can get in your own way (or a loved one’s, therefore jeopardizing your supply of tasty treats) if you don’t set up your kitchen correctly. Of course we all have unique configurations and different amounts of space to work with, but here are a few helpful suggestions from Baking with the Cake Boss. 1. Work area. If possible, dedicate some counter space to prep work, which is the preliminary work that takes place before the actual baking: chopping, mixing, rolling, and so on. You’ll want some counter space (or table space) where you can keep your basic equipment, which in the case of baking is the rolling pin, mixer, measuring spoons and cups, spatulas, and so on. If there are drawers beneath or above this area, that’s where you want to have your parchment paper and plastic wrap. The ideal scenario is that once you’ve gathered your ingredients from the fridge and pantry, you can do all your mixing, rolling, and other tasks without moving from one spot. 2. Keep the sink and stove areas clear. If at all possible, keep the counter space closest to your oven and sink free and clear and—just as important—clean. Why? Because you are constantly setting things next to the sink, or removing things from the oven, or adding things to a pot on the stovetop, so counter space is precious. Don’t store things there if you don’t have to. 3. Storage. Keep all your dry goods for baking in one place: sugar, flour, baking powder, baking soda. You might even consider keeping two containers of salt in your kitchen: one in your baking area and one closer to the stove. This way, you can gather all your ingredients swiftly. It also makes it easy to prepare a shopping list because you can take a quick inventory without having to search all over your kitchen to find out what you have and don’t have; you can just calmly check your baking area and see what needs replenishing. 4. Baking equipment. Equipment such as pans, mixing bowls, and the like doesn’t need to be stored right next to your prep area. In fact, I suggest storing these near your dishwasher or drying rack, because that’s the last place they’ll be before you put them away. CALL IT THE BUDDY SYSTEM, because Baking with the Cake Boss is an education in the art of baking and decorating, from kneading to rolling, fondant to flowers, taught by Buddy Valastro himself, the star of TLC’s smash hit Cake Boss. With more than 100 of his most sought-after recipes, including birthday and holiday cakes and other special theme designs, this book is a master course that culminates in the showstopping cakes for which Carlo’s Bake Shop is famous. Following the arc of Buddy’s career from apprentice to master baker, Baking with the Cake Boss offers readers the same on-the-job education earned by everyone who comes to work at Carlo’s Bake Shop, with some of Buddy’s and the family’s memories shared along the way. It builds organically from simple cookies and pastries to pies, flower-adorned cupcakes, and basic fondant cakes, to breathtaking cakes for every holiday and special occasion. And, as you progress from basics to bedazzlements—like the safari cake complete with chocolate animals and a waterfall—Buddy shares his inspiring enthusiasm and stories from the shop in his inimitable voice. He also provides the tools for creating your own personal trademark cakes, with a chart that lets you mix and match cake, frosting, and liqueur syrup for cakes the way you like them. And there are plenty of photos that illustrate artistic flourishes and decorations you can use to adorn your individual creations. 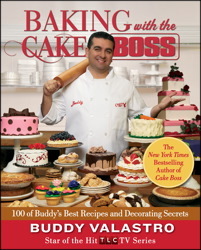 With 650 gorgeous, step-by-step instructional photos that let you follow Buddy as if you were next to him in the bakery, Baking with the Cake Boss is an incomparable dessert education that will become an essential reference for aspiring and skilled bakers alike.Bursting with delicious, tried-and-true recipes, how-to boxes and sidebars, and numerous tricks of the trade, Baking with the Cake Boss is a rare treat—a fun, accessible guide to baking, all in a gloriously designed, fully illustrated package worthy of the Cake Boss’s artistic vision.